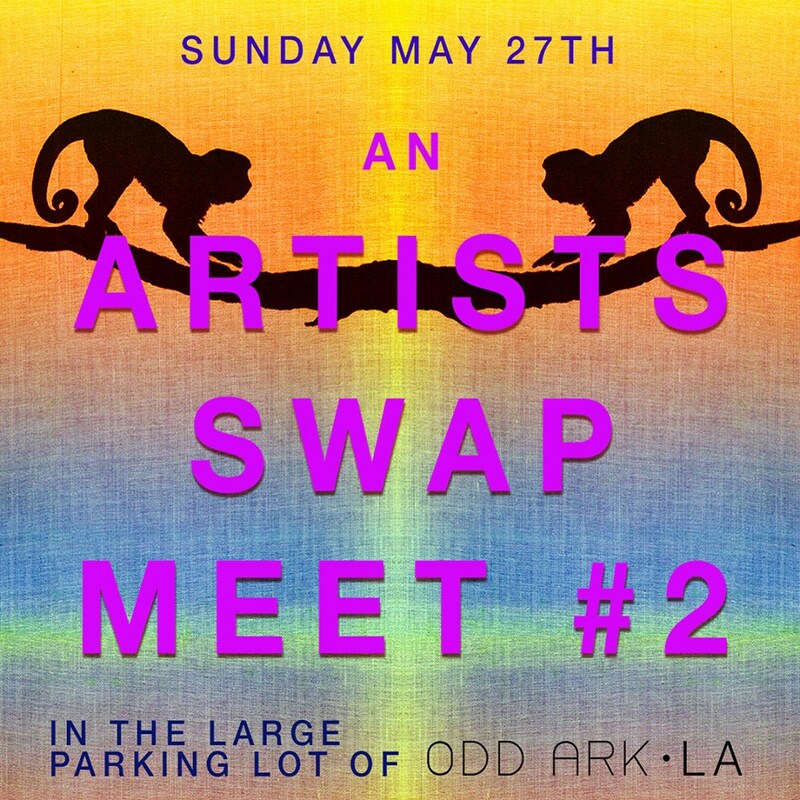 ODD ARK • LA invites you to the Third Artists Swap-Meet! A happening, exhibition, sale, community gathering, cultural exchange and an opportunity to recycle and reduce our environmental footprint. artists, artist collectives, artists run spaces, art publications. >>> OVER 40 PARTICIPANTS with the work of over 100 artists presented! *Event curated by opportunity, chance and serendipity. Participants keep 100% of sales! Carla issue 14 Launch Party+ Gadzinas Bell by Lauren Satlowski. 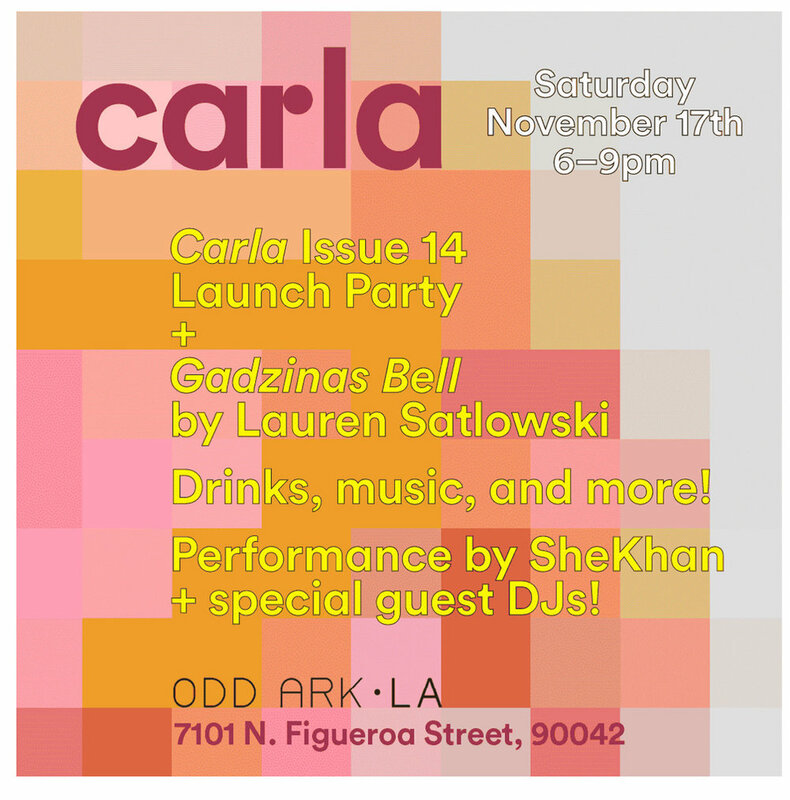 Join us Saturday November 17, 6-9pm as we co-host and celebrate the Launch of Carla issue#14 at ODD ARK•LA. Come get your free issue, have a drink, and see a live performance by SHEKHAN and guest DJ’s. Currently on view at Odd Ark• LA is Gadzinas Bell by Lauren Satlowski. Viewing art in traditional and formal settings can be an alienating experience and physically unaccommodating, however, for many of us, art is a tonic, a soma, or even an analgesic… that calls for a more tangible and comfortable viewing experience. AN ART DEN breaks down conventional systems of art viewing and invites visitors to sit comfortably on a pillowed floor and sift through works by over 100 artists. Works may be leafed through, held, shared and passed around to other attendees - not unlike an Opium Den or Hooka Lounge. This direct and communal viewing experience opens up exciting possibilities of chance operation and conversation about the work that will hopefully be both deep and expansive. All of the works will be for sale and affordably priced - ranging from $20 to $900 (with an average price $150). Purchased works will be available to take home. Join us for an Artist's Talk. Participants: 5 Car Garage, Big Pictures Los Angeles, JACOB’S Los Angeles, Curatorial Hub, ARVIA LA, Alika Cooper, Eric Wesley, Cheryl Bently, Jamie Felton, Alice Lang, Molly Shea, Sarah Cromarty, Katie Herzog, Thaddeus Strode, Benjamin Weissman, Jane Parrott, Martin Durazo, Claudia Huiza Presents, Tim Biskup, Cathy Akers , Ginny Cook, Kristy Luck, Christopher Kuhn, Rema Ghuloum, Daniel Cummings , Andy Bennet, Brittany Lombari, Aida Lugo And many more! An Evening of performance organized by artist Brian Randolph. Doors open at 6pm for exhibition viewing. SENON WILLIAMS - New Lithograph Release Exhibition. 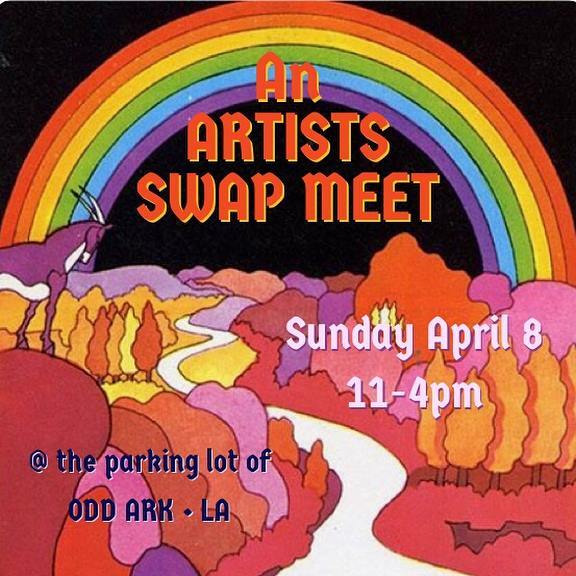 ODD ARK•LA and Hamilton Press are pleased to announce a one-day exhibit to celebrate the release of a new lithograph by visual artist and musician Senon Williams, produced by Hamilton Press. The exhibition will feature a small number of limited edition lithographs and original drawings presented in reclaimed wood frames -handcrafted by Senon Williams. *Special sound performance by Mark Lightcap at 6pm. Senon Williams’s text and image works depict poignant and contemplative visualizations that explore the inherent human struggle in both ancient and contemporary times. Since 1990, Hamilton Press has been collaborating with artists specializing in the production of lithographs hand-printed by Tamarind Master Printer,Ed Hamilton. TRY TO RELAX, A 90 minute solo percussion performance by percussionist Ted Byrnes. TRY TO RELAX is the challenge of maintaining relaxation while performing music that is intended to be challenging, dense, anxiety-inducing, and aggressive. TRY TO RELAX is the challenge of maintaining relaxation while HEARING music that is intended to be challenging, dense, anxiety-inducing, and aggressive. Arrive around 7pm, performance starts precisely at 7:15pm. A New Years Day sound-work by Dani Tull with guest vocals by Brian Randolph. Utilizing 2 small vintage Farfisa Portorgans, artist Dani Tull will perform a binaural sound work within the illuminated chamber of the empty gallery. Using the low-fi analog of non-digital instruments, Tull’s chord-organ performances are typically produced by sustaining and arranging notes that create a microtonal and harmonic ambient resonance. Special vocal contributions by artist Brian Randolph. Start the new year right by dropping into a deep-listening sensory experience intended to restore and balance the inner and outer vibes. Tea will be available, feel free to bring something soft to sit or lay down on. Performance and Cassette Tape Release Party Event. 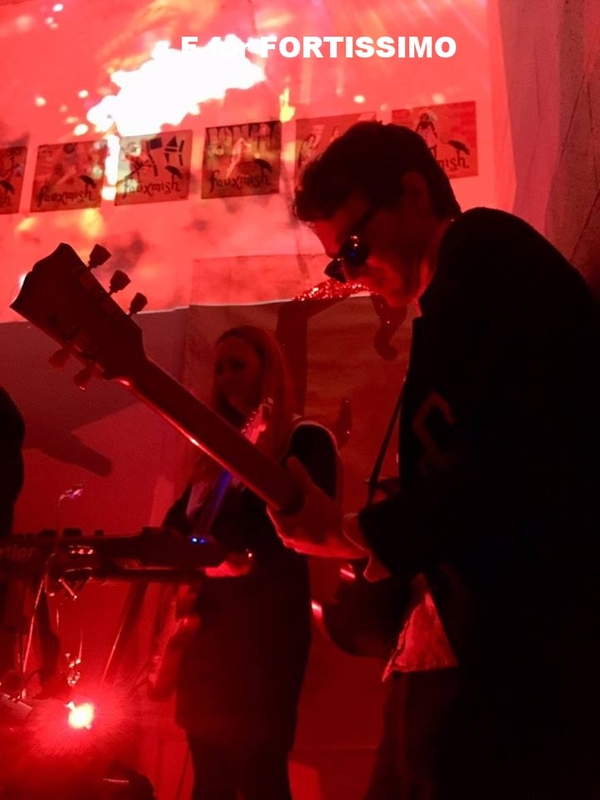 This performance celebrates the release of their limited edition cassette F for FF on Redacted Records. Each cassette is numbered, hand stamped and sealed with red wax, and the edition is strictly limited to 52 copies. Also available at the event was a few remaining hand collaged 12” LPs of their debut album Faüxmish. Contact the gallery for prices and availability.